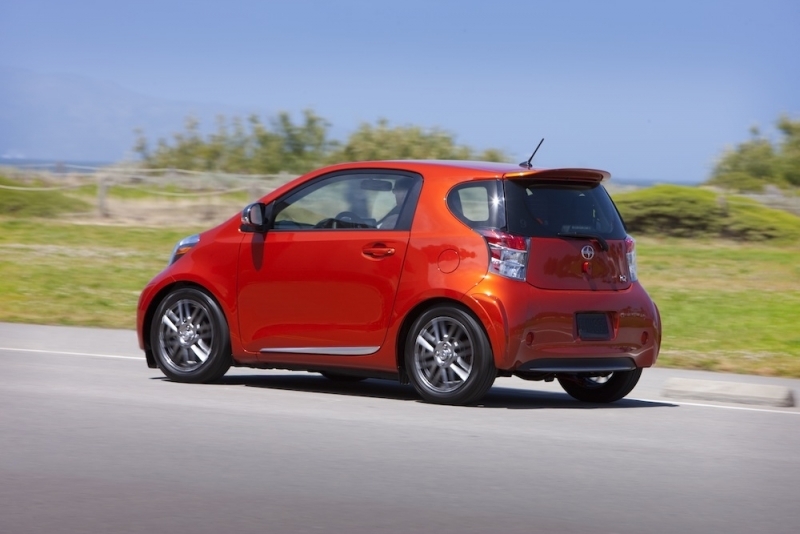 If you eagerly awaited the Smart Fortwo but were disappointed by how it drove, cheer up; the 2012 Scion iQ might restore your faith in micro cars once again. The internationally acclaimed iQ (Green Car of the Year (2010), UK Environmental Transport Association Car of the Year (2008), Japan’s Car of the Year, Japan's Good Design Award (2008), etc.) is ready, willing and able to compete with the likes of the Smart Fortwo, Fiat 500 and even the Mini Cooper. Scion’s iQ proves that offering seating for four in a vehicle only slightly larger than a Smart doesn’t have to result in neglected driving dynamics. And you can be certain of its green cred too: its 37 mpg is the best combined fuel economy of any non-hybrid. It represents major functionality in a small package and a way for Americans to wean themselves off super-sized vehicles. Of course, the iQ isn’t a feasible option for everyone, but its many features - not to mention its 11 standard airbags! – make living with a small car more of a reality than it has ever been in the past. The looks are hip and edgy, but not too much to push people away. A unique 3+1 seating layout is new to our car market and helps maximize space efficiently. The iQ is one of few cars that can pull off the color “Hot Lavaâ€. Returns 37 mpg combined, and has an impressive turning radius. The number of cabin features for the $16k price is impressive. A small package does require compromises, and the iQ isn't as roomy as some comparably priced cars. The U.S. won't get the manual transmission option offered in Europe and Asia. No hybrid/electric option (for now) to please the greenies either. Rear crash protection might be a concern for rear passengers despite the industry-first rear curtain airbag. The magic 40 mpg would have been an impressive target to meet. Pulling away from a parallel parking spot for the first time is surreal thanks to the iQ’s absurdly small turning radius. City drivers will never have to make a multi-point turn again. 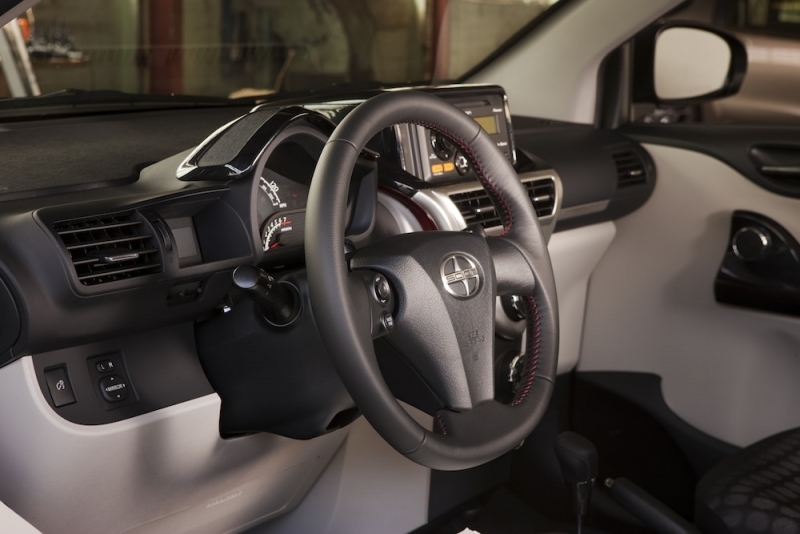 The seating position is currently one of Toyota’s best, and the steering wheel is well contoured with a high quality feel. The seats hold you well enough when you toss the car into a sharp bend, while the CVT ensures you are at the optimum rpm to maximize acceleration. A good suspension setup creates stable platform that makes the car feel predicable driven at the limit of traction, while the narrow tires add economy and have the welcomed side effect of giving you the sense of going faster than you truly are. With all the add-ons Scion will likely offer and the strong aftermarket support already overseas, this car will be a great platform for driving enthusiasts who want to make a statement out of this a small car. Saying that, it’s also a great car for urban dwellers who need a reliable, get-in-and-go type of car. And compared to the underperforming Smart Fortwo, it is a wiser choice overall. Power to the front wheels comes from an aluminum 1.3-liter inline four-cylinder motor utilizing Toyota's dual VVT-i engine that produces 94 horsepower @ 6,000 rpm and 89 lb-ft of torque @ 4,400 rpm. The CVT (a type of automatic transmission) does a great job maintaining rpms when you want power and saving fuel when you don't. The engine noise is throatier than expected, but not off-putting. The drivetrain has been designed to intrude on cabin space as little as possible. If you strive to be 'green' and live as efficiently as possible, the iQ is worth a test drive. Despite our hopes for 40-plus mpg from this small car, the iQ does produce 37 mpg in the combined test (36 mpg city, 37 mpg highway) - the best available from any non-hybrid. It doesn't have the hybrid cred of the Prius, but it gets points for not taking up any more space than it needs to. A 160-watt Pioneer audio system comes standard with HD radio, a USB input jack and Bluetooth streaming. The optional 200-watt Pioneer system adds a 5.8-inch LCD touch screen, plus iTunes tagging and in-dash Pandora radio control when tethered with an iPhone. For an additional $2,000, an upgraded navigation/audio system is offered with a seven-inch screen and DVD playback. For those looking to augment their stereos on their own, the base model stereo includes RCA subwoofer output and the second-tier 200-watt system includes six RCA outputs for complete customization compatibility. The iQ is America's first example of a car that uses the 3+1 seating layout. During normal two-person use, the passenger can sit in-line with the driver. Add another person on the passenger side and the one in front can slide his seat extra far forward (ahead of the driver), allowing for a decent amount of space for the rear passenger. We were surprised to find the room in any of the first three seating positions more than adequate, even for 6’-plus drivers; however, the fourth seat behind the driver is meant for small children or very short trips. 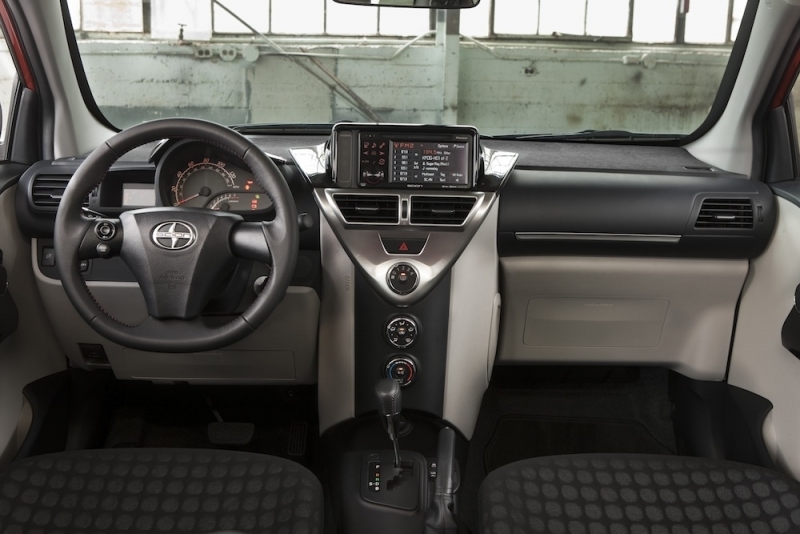 Despite its distinction as one of Scion's lowest priced cars, its materials have a quality feel not common in its price range. 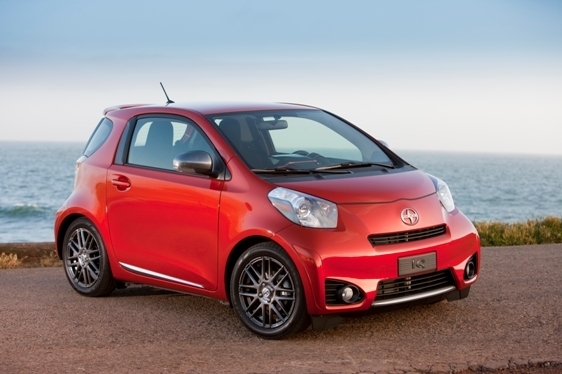 Scion hit the mark with the exterior styling with the iQ. It is has a stout, grounded presence that comforts the worries of protective parents, but has enough flair to excite a younger owner. The body is full of distinct lines and creases that give the car plenty of character and visual appeal. Older buyers will appreciate the functionality of the form as well. An array of paint colors draws attention. Starting at $15,265 (plus $730 DHP fee), the Scion iQ is for buyers who will value its small size and efficient use of space, and it will be a major contender against the Smart Fortwo, Fiat 500 and Toyota’s other subcompact, the Yaris. The worry is that the iQ will face competition from larger, similarly priced economy sedans or hatchbacks. The Scion iQ is the first viable ‘micro-subcompact’ to be introduced in America, and can even be considered as another option for the style-conscious unrbanites that have flocked to the Mini brand. The iQ offers a similar stylish presence at a fraction of the price and drives nearly as well in most urban situations. It drives better than the Fiat 500 and has a more sophisticated feel overall. With great fuel economy and an impressively low price, the Scion iQ heralds a new generation of micro cars that don’t make you sacrifice performance and features for space.